Dip your favorite chips into this warm, gooey and satisfying Crock-Pot All In Hot Dip! It’s only 6 ingredients and is packed with flavor! 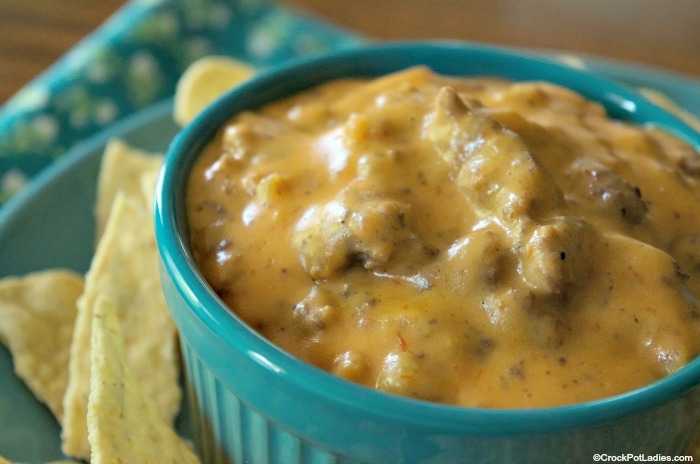 Dips made with American processed cheese (AKA Velveeta) are some of my favorites. I know that some folks have an aversion to them but I have a secret obsession (okay maybe it is not much of a secret) with how great Velveeta cheese melts down into utter cheesy goodness. 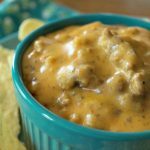 This recipe for All In Hot Dip has just 5 ingredients…hamburger, ground pork, Velveeta, cream of celery soup and a jar of salsa. Yes you will need to brown up the hamburger and ground pork in a skillet first but that only takes a few minutes. Then just toss everything else in your slow cooker and let it cook away until the cheese is hot and melted. Serve this cheesy dip with some tortilla chips at your next party and your guests will leave with a smile on their faces! 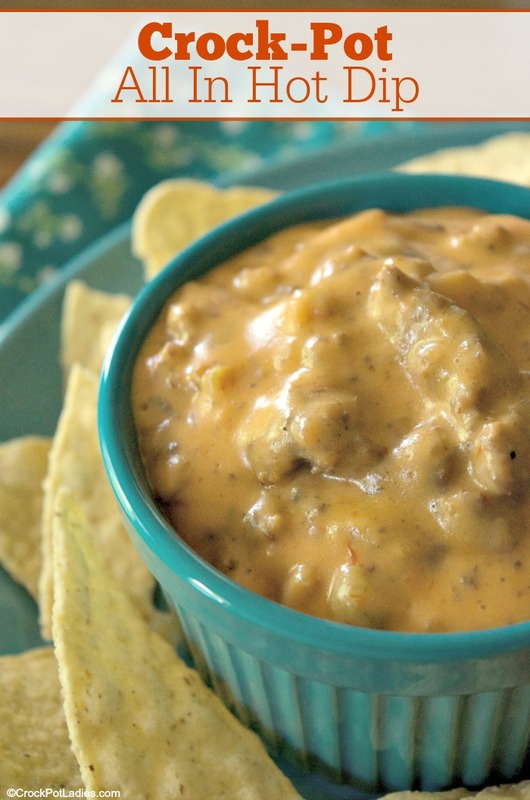 Serve this warm, gooey and cheesy dip with your favorite tortilla chips for a dip everyone will love! On the stove, cook and drain the ground beef and sausage. 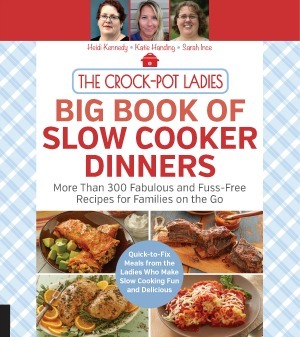 Add cooked ground beef, sausage and remaining ingredients into a 4 quart slow cooker. Cover and cook on HIGH for 1 to 2 hours, stirring occasionally until the cheese is melted. Turn slow cooker to the WARM setting to keep it warm while serving. Serve with chips or crackers. This recipe was first published in April 2013. And we have decided it was time for an update. New photos, as well as special diet and nutritional information has been added. We hope you enjoy! Lately I have had Pinterest notify me that one or more of my pins FROM YOUR WEBSITE had been deleted. They said that there had been a complaint and that I was not authorized to use that pin. So…just curious here, but if I can’t pin a recipe, why do you have a pinterest button on the recipes and why do you offer the recipes in the first place? This has me really confused. Hi tonilea, I received that notification from Pinterest as well. And it appears that someone decided to report the pin on Pinterest and Pinterest deleted it. I have contacted Pinterest and cleared the matter up and proved proper ownership and copyright to them. However it appears that Pinterest is unable to restore pins once they have deleted them. I am sorry for the confusion. I really am sorry Nancy. I am working with Pinterest to get to the bottom of this. I cannot control someone who is reporting my pins as not belonging to me. I tried this dip with chicken rolls and OH MY GODDD, it tasted yummmmmmmm! So glad you enjoyed the recipe Sam!